BCS takes on Principal’s Reading Challenge. Belgrade Central School got into Family Literacy Month and National Young Readers Week with Pizza Hut’s Book It Principal’s Reading Challenge! BCS held the challenge as part of Spirit Week on Tuesday, November 6th and paired it with Dress as your Favorite Book Character day. 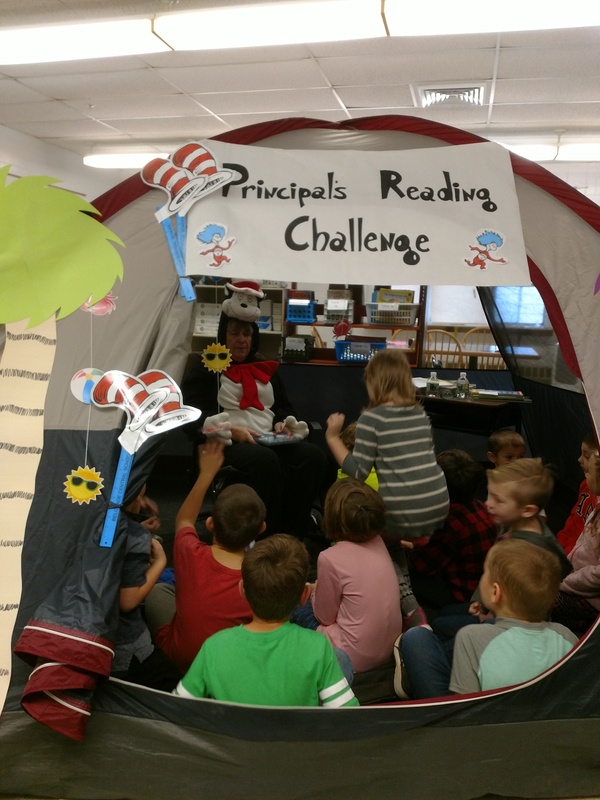 The Book It Principal challenge is an opportunity to spend a day dedicated to reading in all subject areas and potentially earn free books for the school’s library. BCS students spent the day doing a variety of reading centered activities. Classes brought in pillows and blankets, read about Math concepts, did fun reading activities that paired older readers with younger readers, and generally relaxed and enjoyed the written word throughout the day. The library had groups listening to online storybooks, and BCS principal Gwen Bacon had a tent set up where she spent the day reading to students. The main goal of the day was to get students reading from the first bell until the last bell. If BCS is selected, they will win Kate DiCamillo books for the entire school! Previous MHS hosts El Dia de los Muertos presentation.